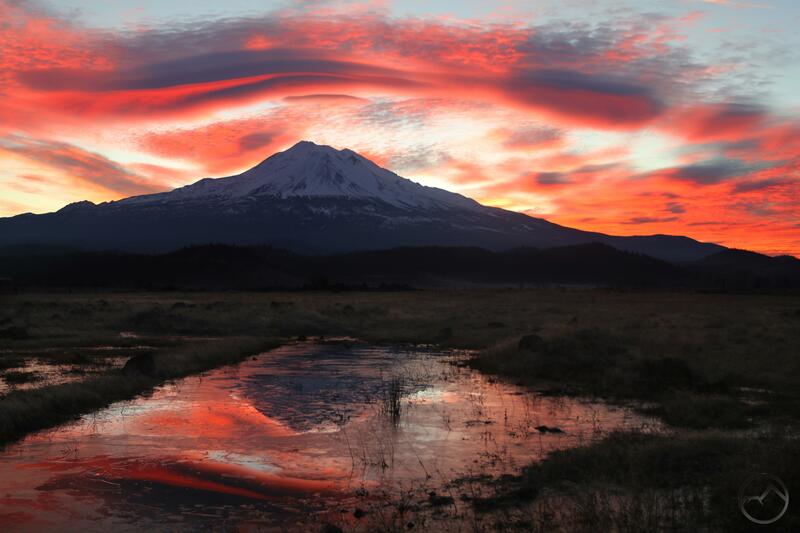 A stupendous Mount Shasta sunrise. This morning was one of the most majestic sunrises I have seen in Mount Shasta. It had everything one could hope for in an event of this nature. There was an unusual lenticular cloud, vivid color and a nice reflection bringing light to an otherwise dark landscape. It was glorious. However, as if it was not enough, I observed a most unusual shadow cast by Mount Shasta. The sum of the entire spectacle was a most edifying, praiseworthy scene. Watching the weather forecast, I had a good sense that something would manifest over the mountain. I planned on getting up and assessing the situation early. Depending on what I saw, I would decide where to go to watch the sunrise. Out the door in the dark, there was just enough light on the horizon to make the clouds discernible. I could see a wave-like formation above Mount Shasta. With a sense of excitement, I headed off to the Shasta Valley. It looked like north was the way to go, since the cloud seemed to be just south of the mountain. I wasn’t sure where in the valley to go, however. I decided to head to my reflection pool and see if it was windy before proceeding to another spot if necessary. When I arrived at the pool, the cloud had grown and was more obvious as light crept slowly over the horizon. The pool proved to be an ideal perspective on the cloud. However, while there was no wind, the water was completely frozen. There was no reflection on the opaque ice. As the sky lightened, I tossed large rocks to break up the icy crust. The water stilled just as color began to explode upon the clouds. First pinks and purples and then, as the sun neared the horizon, oranges and golds. The whole show reflected in the ice-choked water, lighting up the dark landscape. It was magnificent. As the sunrise’s color began to fade, I looked over my shoulder to the west. The sky was filled with clouds that were lit up pink but, to my surprise, there was an odd dark pyramid imposed upon them, just above Bonnet Rock. 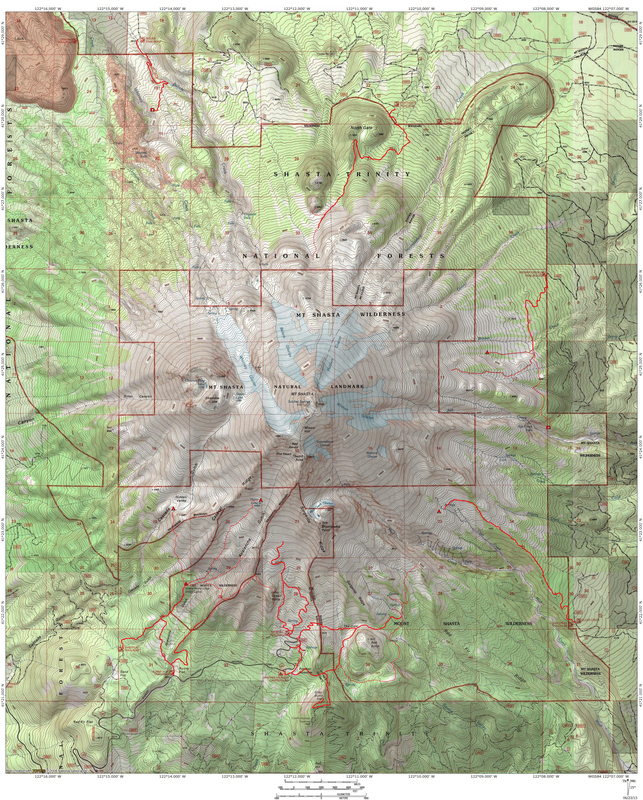 I suddenly realized that it was Mount Shasta’s shadow, cast far across the Shasta Valley. This was something new to me. I have seen the mountain’s shadow at sunrise from on the mountain and I have seen Mount Shasta part the light of the rising sun, casting a shadow above the peak itself. I have not seen the mountain’s shadow projected against clouds on the opposite horizon many, many miles away. It was a strange and distinctly memorable sight. Unfortunately, as the sun peeked above the horizon in the east, the shadow began to quickly diminish. When the sun was up, the shadow was gone. It all happened very fast. I headed home, but on the way, I was compelled to stop and capture one last image of the lenticular above Mount Shasta. From the west, the cloud had a much different appearance. Most notable was a thin, delicate line that marked the rim of a disk hovering below the main formation. It was a fascinating and fitting end to an awesome sunrise. 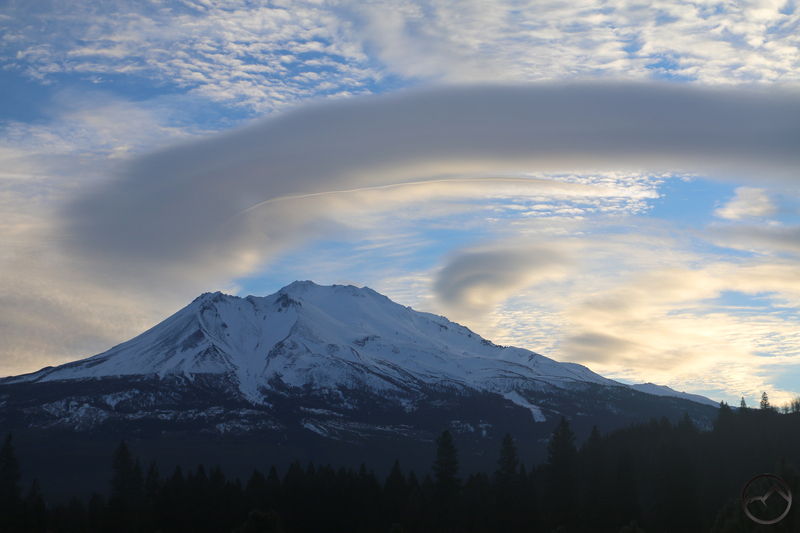 Mount Shasta and the lenticular wave from the west. 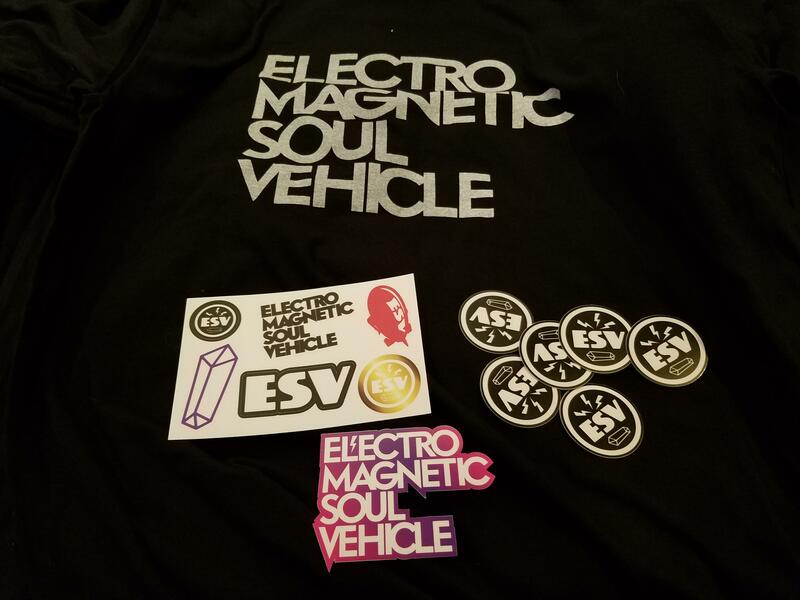 Regarding the title of this post, I wanted to mention the excellent Electromagnetic Soul Vehicle. Dave Theno’s inner-galactic rock opera was performed at College of the Siskiyous this weekend and, in my assessment, was a great success. The music and choreography were awesome and the vibe at the show was a lot of fun. In many ways, it was the most “Mt. Shasta” thing I have experienced! I hope that it has a long future and that it becomes an annual event. After seeing the first performance on Friday night, I have had a few of the songs stuck in my head all weekend, especially Rosalia and Lemurian Sunrise. The latter, the opera’s grand finale, kept running through my head as the sun came up this morning. It was a great “Mt. Shasta” moment at sunrise at Mount Shasta. The photo below is truly amazing! Thank you so much for sharing with the rest of us. Thank you Dorinda! I really appreciate your saying that.